The unmissable pool at La Veranda, overlooking the beach on Phu Quoc, Vietnam. An idyllic east-meets-west escape, La Veranda overlooks beach on Phu Quoc, Vietnam, while the resort is a 19th-century colonial oasis. 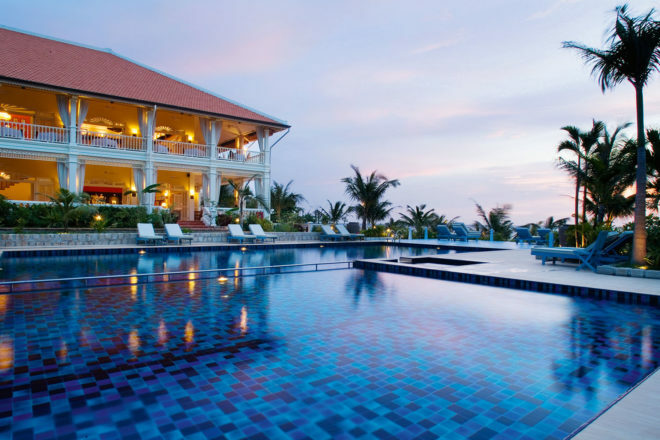 Flanking Bai Sao Beach, an arc of powdery white sand sweeping down to crystal clear waters, the 19th-century colonial-style resort reflects a majestic French mansion, with white terraces and large wraparound balconies studded with wicker chairs and low slung fans. Visit the markets, feast on freshly caught seafood and pick up pearls and bottles of locally made fish sauce, both highly prized on the island. November to March, or the shoulder season April to June and late October to escape the crowds.